Now is a great time to eat locally grown vegetables. 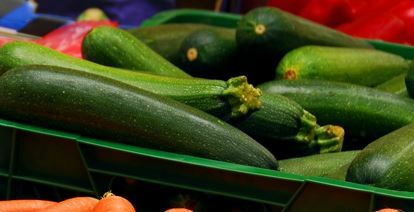 Depending upon where you live, there may be an abundance of vegetables such as zucchini, tomatoes and peppers. Now is a great time to buy local fruit and vegetables and to support your local farmer’s markets. Zucchini Stir Fry is a recipe that is tasty, easy-to-make and inexpensive. Using fresh basil in this recipe just adds to the flavor. For maximum flavor, remember to add fresh herbs towards the end of the cooking time. Just in case you need a reason to eat more fruits and veggies, look at the Top 10 reasons listed below. An easy way to increase your fruits and vegetables is to make half of your plate fruits and vegetables. Now is a great time to enjoy the bountiful produce of summer! 1. Peel the onion. Cut it into thin slices. 2. Slice the yellow squash into thin round pieces. 3. Slice the zucchini into thin round pieces. 4. Chop the red pepper into small pieces. 5. Heat the oil in a frying pan or stir-fry pan. Add the onion slices. 6. Cook over medium heat, stirring quickly for 1 minute. 7. Add the spices and stir a few times. 8. Cook for 3 to 5 minutes till vegetables are just tender. Color and Texture-Fruits and vegetables add color, texture and great taste to your plate. Convenience- Fresh, frozen, canned or dried- fruits and vegetables are portable and easy to fix. Fiber- Fruits and vegetables provide you with fiber which fills you up and keeps your digestive system happy. Low in Calories- Naturally low in calories, they make a great choice if you are watching your calories. May Reduce Disease Risks-Eating fruits and vegetables may reduce your risks of diseases such as high blood pressure, heart disease and some cancers. Variety-Fruits and vegetables are available in many varities, you have many to taste test. Natural snack-Fruits and vegetables are nature’s treat and make a quick and easy snack. Fun to eat-Some you peel, crunch or squirt making eating fun. Tasty and Delicious-Fruits and vegetables are nutritious and delicious. Try a new one today. I love squash – so easy to prepare, reasonably priced, and versatile. Thanks for the tips!